The Finnish basic income experiment is coming to an end. A recently launched evaluation study is now looking at the income, employment and wellbeing effects of receiving a basic income. Results will become available during 2019 and 2020. Adopted by Juha Sipilä’s Government as one of its policy initiatives, the basic income experiment was launched in January 2017. Participants in the experiment are paid a monthly basic income of 560 euros for two years. The 2,000 participants were selected from among the 175,000 persons who received basic unemployment allowance or labour market subsidy payments in November 2016 and were between 25 and 58 years of age. The basic income experiment is an exceptional social experiment both domestically and internationally in that it is set up as a randomised field experiment. In addition, because participation has been mandatory for the selectees, the conclusions that can be drawn are more reliable than has been possible in earlier trials. The experiment will continue until the end of 2018 and will be followed by an investigation of the effects of receiving a basic income. The Finnish Ministry of Social Affairs and Health has signed an agreement with the Social Insurance Institution of Finland (Kela) on the implementation of the evaluation study. Kela is responsible for organising the evaluation study and will conduct it together with the VATT Institute for Economic Research and other partners. The study design calls for the evaluation of the effects that the basic income has on employment and wellbeing, drawing on registry, survey and interview data. Both the experiment itself and the follow-up evaluation are generating considerable international interest. The Government is primarily interested in the experiment’s effects on employment. They can be analysed on the basis of data collected in official registries compiled by Kela, the Finnish Centre for Pensions, the Ministry of Economic Affairs and Employment and the Finnish Tax Administration. The first results based on registry data will become available in early 2019. Because of the time lag involved in compiling the registry data, these results will focus on the first year of the experiment. Registry data for the entire timespan of the experiment (2017–2018) will not become available before the end of 2019. The registry-based study will look at the impact of the basic income on employment, taxable earnings, take-up of unemployment benefits paid out by Kela, and enrolment in employment services. Already when the legislative groundwork for the experiment was laid, it was noted that there are many topics which official registries do not capture but which are relevant to people’s lives. The Parliamentary Committee on Social Affairs and Health therefore proposed that the experiment should also look at the wellbeing outcomes of the experiment. With that in mind, the research team will carry out a phone survey in late 2018. The structured survey will focus on how the respondents perceive their wellbeing and health, subjective stress, economic security, trust, interactions with government agencies, time-use and social inclusion. The survey will target both the experimental group of 2,000 persons and a sample of 5,000 members of the control group. The members of the control group received unemployment benefits from Kela in November 2016, but were not enrolled in the basic income experiment. Contingent on the respondent’s consent, the survey data are combined with data culled from registries. The survey utilises some of the same batteries of questions as such widely used surveys of wellbeing as the European Social Survey, the International Social Survey Programme, the European Union Survey on Income and Living Conditions, and the Regional Health and Well-being Study (ATH). In addition to the registry and survey based investigations, the research team will conduct interviews to collect more detailed experiential data. By collecting interview data, the research team hopes to interpret and shed further light on some of the unanswered questions and unexpected results. The interviews will be conducted early in 2019, at which point the team will have access to preliminary results from the registry and survey based investigations. 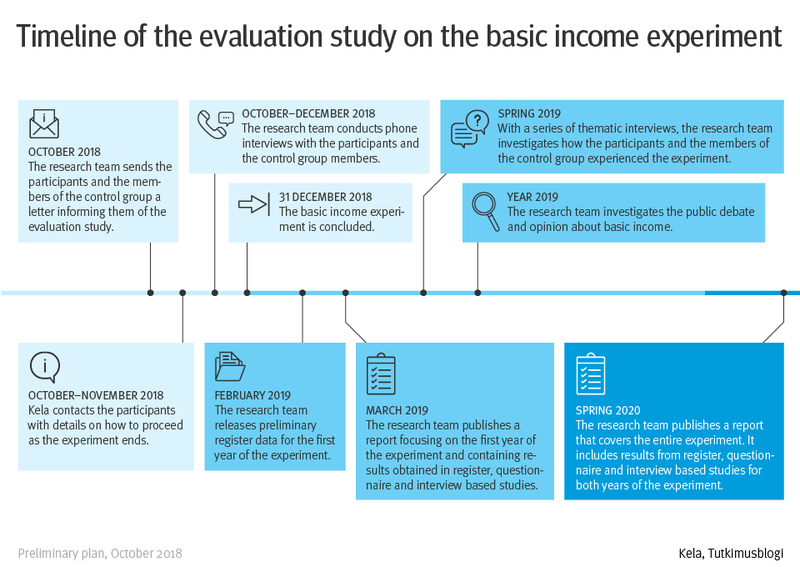 As part of the evaluation study, the research team will also look at popular support for the basic income and the public debate surrounding it. Preliminary results from the registry and survey based investigations for the first year of the experiment will come out in February 2019. A somewhat more extensive report which will also contain results obtained in the interview study will be published in spring 2019. The main report containing full analyses of the two-year experiment will be completed in late spring of 2020. Following the completion of the evaluation study, steps will be taken to store the data in accordance with data privacy laws to enable further research use. Perustulokokeilun arviointi – mitä tutkitaan ja milloin tulokset julkaistaan?